At age 15, Celeste Rojas began her own grassroots organization called Girasoles en Marcha to empower Latina girls like herself using connections she already had. A year later, the high school student from Los Angeles, California splits her time between school and her organization to help motivate the girls in her community. Read on to learn more about Celeste and her idea. The mission of Girasoles en Marcha is to inspire a positive identity for young Latinas through the preservation of their cultural heritage within educational spaces. The young girls are each paired and elected one mentor that will guide them to learn the curriculum. They act as big sisters to the girls. I implement the curriculum surrounding the fundamentals of culture, community, leadership, and science. On special occasions, we go on field trips to museums, shows, workshops or even welcome guest speakers to come and talk to the girls. Well, I saw that the girls in my community weren’t motivated to do anything. They mostly cared about brand new diets, the newest trends, and boyfriends. The most disappointing part was that they weren’t proud of where they came from. They would immediately shun the question away when someone brought it up. I wanted to create a safe space where we could appreciate our Latino culture while still valuing our American culture by targeting ages 5-9 to start planting that seed within them. In order for us to make Girasoles En Marcha possible, we need financial help. Lately we have been fundraising chocolates for supplies in the classroom, t-shirts, work space, and field trips. Below is our GoFundMe page. We would immensely appreciate any donation that you gift us. The girls have become very engaged in the program. They never seem bored. Although they do mention that it could get hard which is understandable because the subjects target their analytical abilities. Yet their curiosity still manages to overrule. Like the smaller girls, the teen mentors also seem very engaged. I also provide outings for them like plays, art shows, and workshops. Girasoles En Marcha is coming to life. My advice is that you cannot be lazy. In order to bring life to your idea, you have to get up and start working constantly. The more work you put into implementing it, the more success you and your idea will have, especially if it brings success to others as well. In the end, you will feel very proud, trust me! I love to write and plan! I am involved in WriteGirl and my school newspaper. I would love to to be a screenwriter for a show or even a movie. 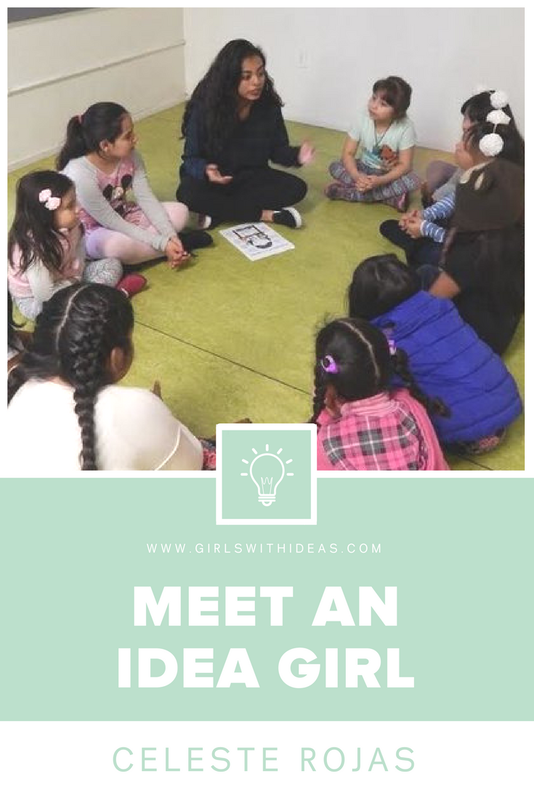 If you know a girl with a story like Celeste's, nominate her to be our next featured Idea Girl!